Found 11 file extension associations related to Autodesk Animator and 9 file formats developed specifically for use with Autodesk Animator. 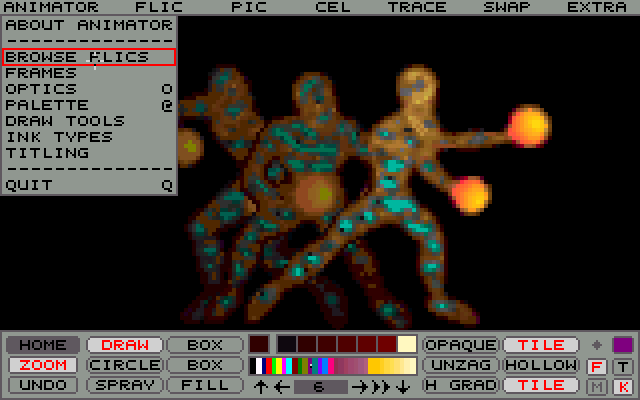 Autodesk Animator was a 2D animation and painting program created in 1989 by Yost Group for Autodesk (makers of AutoCAD and 3D Studio Max) and ran on a PC under MS-DOS. The program was considered to be ground breaking in the field of computer animation when it was initially released and was very popular in the late 1980s and the early 1990s. Eventually the development on the product ended and it became no longer supported by Autodesk. Animator gave the ability to do cel animation (creating each frame as an individual picture, much like traditional Disney animation), "Animator Studio" also had tweening features (transforming one shape into another by letting the computer draw each in-between shape onto a separate frame). While "Animator" and "Animator Pro" supported only the input and output of FLI and FLC animation files, "Animator Studio" supported also the input and output of the AVI animation format. The Autodesk Animator software seems to be old or discontinued. If you need more information please contact the developers of Autodesk Animator (Autodesk, Inc.), or check out their product website.